At Bands For Hire we understand just how important your big day is, which is why we’ve searched endlessly to find the very best string quartets in your area. 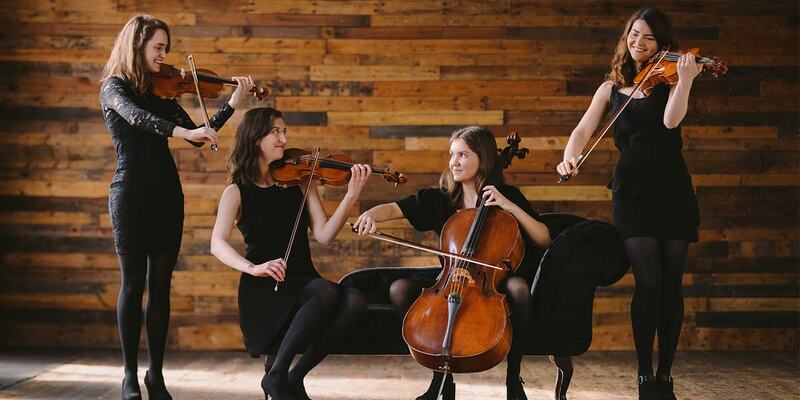 Each and every one of our string quartets promises to deliver a beautiful performance of classical music with style and elegance to compliment wedding receptions, church ceremonies and cocktail parties. Our string quartets for hire are also incredibly diverse, with a range of styles and artists that span from Bach to Bollywood and Gershwin to Gaga. Learning a specific song for your occasion is something all of our groups are happy to accommodate, whether it be a classic or contemporary number. Many of our string ensembles also include alternative line-ups to include string duos and string trios, perfectly complimenting your event with soft and elegant background music. If you’re looking for that perfect song to walk down the isle to or just the right music to set the atmosphere at your champagne reception, we’ll be sure to find the right quartet for your special occasion. Adding a touch of class to your drinks/hors-d’oeuvre reception needn’t be hard to find with the wide selection of professional musicians we have on offer. The right music and song is essential for the bride's entrance into the church and recessional. If a song is not in the repertoire, then not to worry, our musicians will be happy to learn a song or two especially for your big day. Add a touch of grace to the signing of the register or canapés reception with a string duo or trio; it’s a piece of cake! The wedding breakfast should be a relaxing and sociable part of the day, a moment for the bride and groom to enjoy good friends and delicious food. Choosing the right music to set the mood and encourage the right atmosphere is particularly important. Therefore we suggest that a string ensemble would suit this part of the day perfectly, complimenting the relaxed atmosphere and luxury dining. Two violins, a viola and cello showcase a sound of elegance and sophistication for those occasions that require something extra special. Whether it be for a civil ceremony or champagne breakfast, our wedding string quartets will set the desired atmosphere. Our string ensembles offer duos and trios to fit all budgets and venue spaces, so please get in touch for more information. For more live wedding music options please feel free to take a look at our array of talented classical wedding musicians including solo pianists and wedding harpists for hire.